Today, on Tuesday 13 October 2015 the British Institute of Human Rights (BIHR) visited Wellingborough on the 13th day of its 15 Days of Action Human Rights Tour. 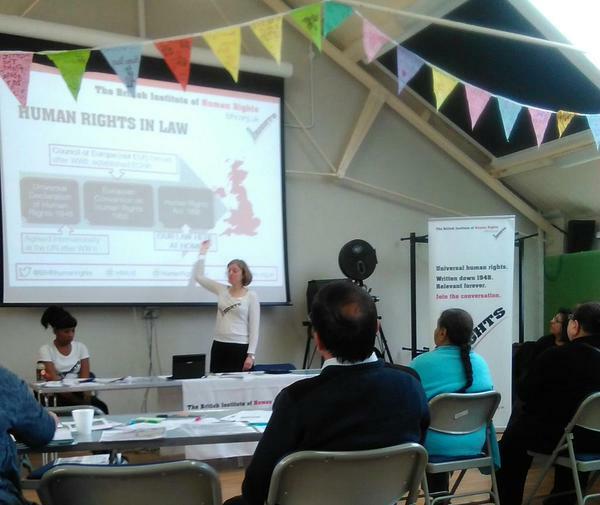 In partnership with NREC they hosted a free high quality full day workshop with an aim of myth busting human rights. Below are just some of the human rights myths raised by attendees that BIHR were able to uncover the truth on. Q) Is the right to keep a pet a human right? Is my landlord breaching my right to a private life by refusing to allow me to keep a pet? A) No, unfortunately keeping pets is not a human right under the Human Rights Act 1998. Q) Is it true that a man was allowed to remain in the UK because he had a pet cat? Teresa May refereed to this in a previous conference. A) No. The man did have a pet cat but this was not the reason why he was allowed to stay in the UK. His case was decided based on his right to a private and family life because he had a long term partner, not because he had a pet cat. Q) Do I need to be a British Citizen or National to earn these rights? A) No. You just need to be human and physically in the UK. Also the principle behind human rights is that they are not earned. They apply to everyone (within the UK jurisdiction). Q) Do children have human rights? A) Yes anyone is protected that is human. Q) Where do people outside of Europe go to get justice for their human rights violations? Can they use the European Convention on Human Rights to hold their government to account? A) No they will not be able to rely on European law but they may be able to rely on other international law. Today’s event has demonstrated just how important it is to keep talking about human rights within the UK. Regardless of the level of your knowledge and understanding it is important that we keep talking about human rights to enable myths to be uncovered and for ordinary people to understand their rights. When OUR Human Rights Act is at risk of becoming a distant memory, it is important that EVERYONE understands what’s at risk and how the loss of OUR Human Rights Act will directly affect them. From the deceased soldier or prison whose family secure a public enquiry into their deaths to the disabled person relying on human rights to rectify degrading treatment, human rights are a safety net we all take for granted until its our turn to rely on them. If you work for a community project or local authority and require consultancy services on human rights please contact NREC to discuss your consultancy needs. If you would like to find our more about human rights, saving the Human Rights Act or upcoming human rights events please contact NREC or BIHR.